The Gordon Square Arts District was formed in 2007 by Cleveland Public Theatre (CPT), Near West Theatre (NWT) and the Detroit Shoreway Community Development Organization (DSDCO), owner of the Capitol Theatre. The partners raised $30 million to build a new community theatre, renovate a long-empty historic theatre into an independent movie theatre, renovate multiple spaces at an anchor theatre organization, build parking capacity and enhance Detroit Avenue with a streetscape. Our work now shifts to building on this base to further grow the area economy and contribute to Cleveland’s renaissance. In 2014, during the final year of the campaign, GSAD began community planning to steward the investment and look to the future. 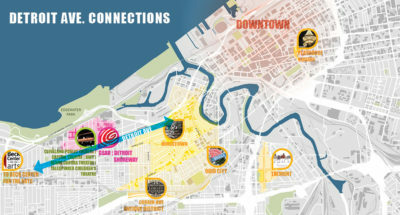 A new Master Plan creates a framework for strengthening the Detroit Avenue core, connecting with the lake and nearby neighborhoods, maintaining focus on the arts and taking the neighborhood to the next level of success. For a copy of the Gordon Square Master Plan brochure, please call 216-961-4242 or or email us at admin@gordonsquare.org.